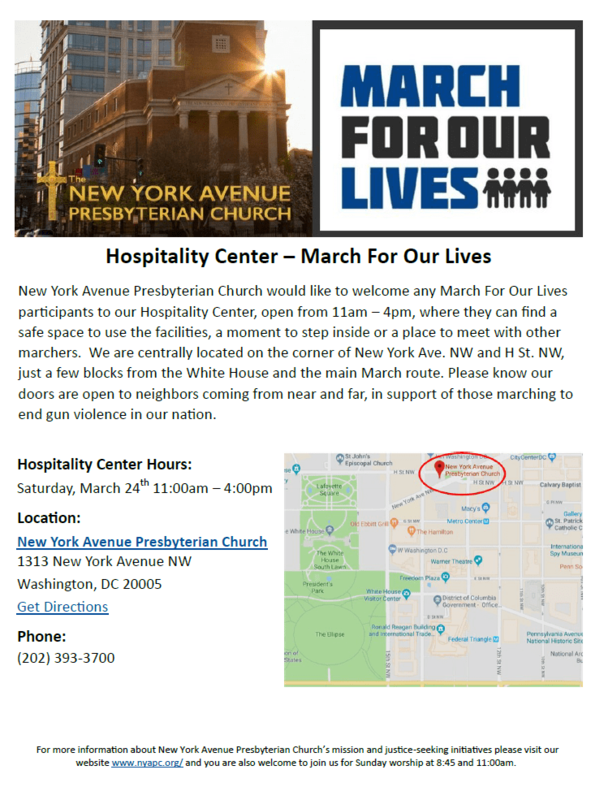 The New York Avenue Presbyterian Church would like to welcome any March For Our Lives participants to our Hospitality Center, open from 11am – 4pm, where they can find a safe space to use the facilities, a moment to step inside or a place to meet with other marchers. 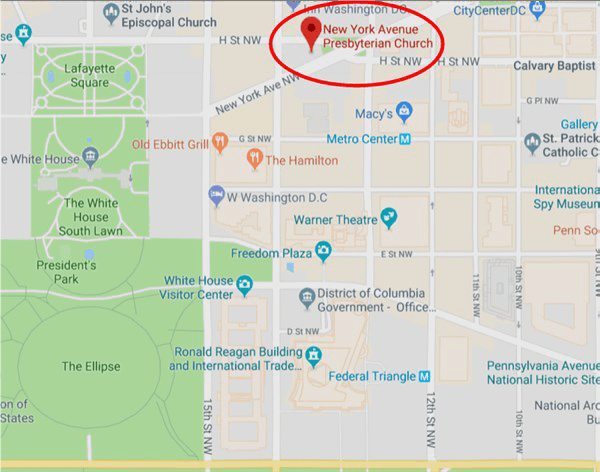 We are centrally located on the corner of New York Ave. NW and H St. NW, just a few blocks from the White House and the main March route. Please know our doors are open to neighbors coming from near and far, in support of those marching to end gun violence in our nation. Click on the link below to download the flyer. WHERE WILL THE MARCH FOR OUR LIVES RALLY TAKE PLACE? WHAT TIME DOES THE MARCH FOR OUR LIVES RALLY BEGIN? WHERE ARE THE ACCESSIBILITY DROP OFF LOCATIONS? There is a designated vehicle drop point at the intersection of 7th Street and Maryland Street, SW.
WHAT ITEMS ARE NOT ALLOWED AT THE MARCH FOR OUR LIVES RALLY? No, only service/guide animals are permitted at the Rally site. Moving around Washington, DC during the March For Our Lives, especially near the National Mall and Capitol grounds, requires patience and a good pair of walking shoes. With hundreds of thousands of visitors attending the march, walking is the best mode of transportation. WHERE CAN I STAY IN DC? There are many hotels within walking distance of the March location. Find more details on staying in Washington, DC here. Crowds for this event will be large, have a plan if you and your family, friends are separated. Reunification services are available at RFK stadium (2400 East Capitol Street, SE) and will operate on Saturday, March 24. WHAT #HASHTAGS ARE BEING USED FOR THIS EVENT?